Having a fair bidding process. Arriving at a fair market value of bank assets. The first is not going to happen and it would be a bad thing if it did, even though Geithner is foolish enough to actually want that. Rather the idea is to make it appear as if there is a fair bidding process so that a fair market value of bank assets can be determined. The key word in the above sentence is appear. Geithner does not want a fair bidding process, nor does he want to arrive at a fair market value of assets. Rather, Geithner does want to avoid a hit to bondholders, at seemingly any taxpayer cost. On March 23, John Hussman discussed the bondholder writeoff situation in Fed and Treasury - Putting off Hard Choices with Easy Money (and Probable Chaos). From early reports regarding the toxic assets plan, it appears that the Treasury envisions allowing private investors to bid for toxic mortgage securities, but only to put up about 7% of the purchase price, with the TARP matching that amount - the remainder being "non-recourse" financing from the Fed and FDIC. This essentially implies that the government would grant bidders a put option against 86% of whatever price is bid. This is not only an invitation for rampant moral hazard, as it would allow the financing of largely speculative and inefficiently priced bids with the public bearing the cost of losses, but of much greater concern, it is a likely recipe for the insolvency of the Federal Deposit Insurance Corporation, and represents a major end-run around Congress by unelected bureaucrats. Make no mistake - we are selling off our future and the future of our children to prevent the bondholders of U.S. financial corporations from taking losses. We are using public funds to protect the bondholders of some of the most mismanaged companies in the history of capitalism, instead of allowing them to take losses that should have been their own. All our policy makers have done to date has been to squander public funds to protect the full interests of corporate bondholders. Even Bear Stearns' bondholders can expect to get 100% of their money back, thanks to the generosity of Bernanke, Geithner and other bureaucrats eager to hand out the money of ordinary Americans. I do not agree with Hussman's views on inflation, but he is always a great read. Please read the above article because protecting bondholders at any expense is indeed part of the plan. On March 30, Hussman did a followup on Abandoning Toxic Asset Purchases. Gross private debt currently stands at about 350% of GDP, about double the historical norm. Meanwhile, many of the assets underlying this debt are being marked down in value by 20-30% or more. Given that GDP itself is about $14 trillion, a continued policy of bailouts will eventually require a commitment of public funds amounting to a significant fraction of $14 trillion. The Treasury's proposal to address insolvency is to finance the purchase of impaired assets from the banks, primarily using taxpayer funds. But note that if the questionable assets are taken off of the bank's books at their actual value, there is absolutely no change on the liability side of the balance sheet. The bank's capital position does not improve. The “toxic asset sale” simply replaces the bad assets with cash. While this might improve the “quality” of the bank's balance sheet, it does not make the institution solvent. Indeed, the only way for the toxic asset sale to increase shareholder equity is if the buyer overpays for the asset. To accomplish this, the Geithner plan creates a speculative incentive for private investors, by effectively offering them a “put option,” whereby taxpayers would absorb all losses in excess of 3-7% of the purchase amount. This is essentially a recipe for the insolvency of the Federal Deposit Insurance Corporation itself, which would provide the bulk of the “6-to-1 leverage.” To the extent that it is not acceptable for the FDIC to fail, the Geithner plan implies an end-run around Congress, and would ultimately force the provision of funds to cover probable losses. An equal concern is that there is no link between removing “toxic assets” from bank balance sheets and avoiding large-scale home foreclosures and loan defaults. All the transaction accomplishes is to take the assets out of the bank's hands, to offer half of any speculative gains to private “investors,” and to leave the public at risk for 93-97% of the probable losses. What the plan emphatically does not do is to affect the payment obligations of homeowners in a way that would reduce the likelihood of foreclosure. Moreover, the last thing that a bank would do with the proceeds would be to refinance such mortgages, because that would provide full repayment to the original lenders while taking on the risk of the newly refinanced loans. Here is the real plan that now seems odds on to succeed. The Plan: Dump $500 billion of toxic assets on to unsuspecting taxpayers via a public-private partnership in which 93% of the losses are born by the taxpayer. This is not a new revelation, there have been many articles on that theme over the past week. However, most missed the corporate bond connection. Steve Waldman is another one who caught the corporate bond connection in Dark Musings. I am filled with despair, not because what we are doing cannot "work", but because it is too unjust. This is not my country. I think that critics of the Geithner plan are missing some of its tactical brilliance. My guess is that behind the scenes, Geithner has arranged a kind of J.P. Morgan moment. I don't think the scandal of the Geithner plan is going to turn out to be the subsidy to well-connected investors embedded in the non-recourse loan put option. On the contrary, I think that Treasury has already lined up participants for the "Legacy Loans Public-Private Investment Fund" and persuaded them to offer prices so high that despite the put, investors will expect to take a major loss. My little conspiracy theory is that the Blackrocks and PIMCOs of the world, the asset managers who do well by "shaking hands with the government", will agree to take a hit on relatively small investments in order first to help make banks smell solvent, and then to compel and provide "good optics" for a maximal transfer from government to key financial institutions. Why would PIMROCK go along with this? Because they feel it is their patriotic duty to work with the government for the good of the financial system, even if that involves accepting some sacrifices. And because they hold $100B in J.P. Citi of America bonds, and they've received assurances that if we can get the nation out of the financial pickle it's in, there will be no haircuts on those bonds. "Shaking hands with the government" means that nothing ever has to be put in writing. Welcome to America, 2009. Change we can believe in. Nouriel Roubini asks The Public-Private Partnership Investment Program (PPIP) – Will It Work? The theoretical foundations of Geithner’s plan are provided by Lucian Bebchuk from Harvard University among others. He explains that “if the underlying market failure is at least partly one of liquidity, an effective plan for a public-private partnership in buying troubled assets can be designed. The key is to have competition at two levels. Geithner’s plan seems to follow these guidelines to a large degree. In particular, on the one hand the government subsidy allows private investors to bid a higher price than otherwise warranted (i.e. the government gives investors the equivalent of a call option.) On the other hand, the fact that the private investor is bound to lose its entire equity stake if the asset value deteriorates from artificially high valuations provides an incentive to bid conservatively. Both effects together may contribute to a reasonable level of price discovery. 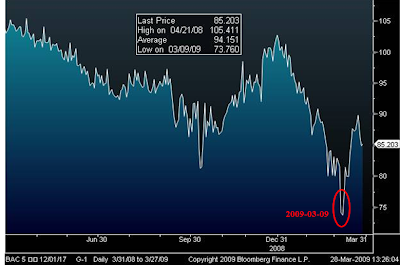 We can quickly dismiss the idea of a "reasonable level of price discovery". 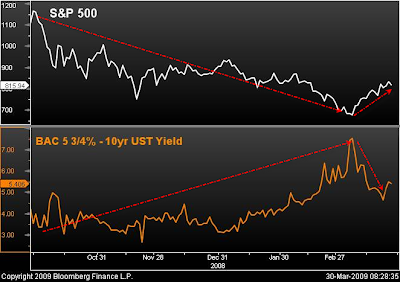 Inquiring Minds are investigating corporate bond prices vs. the S&P 500. 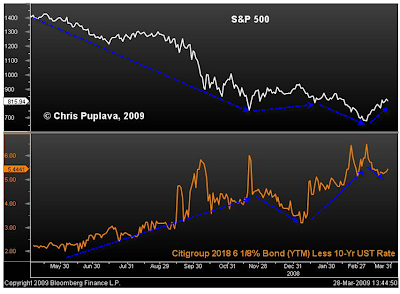 Chris Puplava at Financial Sense was kind enough to select some bond issues from a Bloomberg terminal last weekend to test an idea I had. The following bonds were selected at random from hundreds of pages of bonds. These issues may or may not be representative, but the price action appears to be leading (or at least coincident with) the stock market in direction although not magnitude. Click on any chart below for a sharper image. 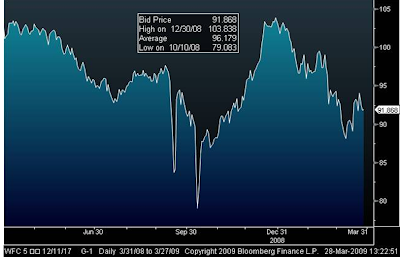 The S&P 500 bottomed on March 9, the same day that the Bank of America bond bottomed. Also note that the stock market made a new low with the Bank of America bond even though Citigroup and Wells Fargo bonds bottomed last year. Bank of America (and Bank of America bonds), have arguably taken over from Citigroup as the most important financial stock and bonds to watch. Unfortunately we can be certain that $500 billion is just the first round. We know this from Hussman's analysis. We also know this from what Geithner is saying. Please consider Geithner Says Some Banks Need ‘Large Amounts’ of Assistance. After allocating about 80 percent of $700 billion in aid approved by Congress, administration officials want to keep open the option of seeking more. Geithner said the Treasury has about $135 billion left in a financial-stability fund while declining to say whether he will request additional money. “If we get to that point, we’ll go to the Congress and make the strongest case possible and help them understand why this will be cheaper over the long run to move aggressively,” he told ABC News. Geithner announced this month a plan shore up the nation’s banks with a public-private partnership to finance the purchase of illiquid real-estate assets. The program will ensure banks emerge from the crisis “cleaner” and “stronger,” Geithner told ABC News. “The great risk is that we do too little rather than too much” to revive credit and stem what economists say may be the worst recession in seven decades, he said. Banks need to show more willingness to take risks and restore lending to businesses in order for the U.S. economy to recover from the recession, Geithner said. “To get out of this we need banks to take a chance on businesses, to take risks again,” he said. “The investors are taking risk, their money is at risk and at stake,” he said. Allowing investors to leverage their money with government contributions and guarantees “is a relatively conservative structure,” similar to when an individual obtains a mortgage to buy a house, he said. We are in this mess because banks and financial institutions took insane levels of risk. It is virtually impossible that risk taking can take us out of this mess. This is the part of Geithner's plan that is going to fail spectacularly. Geithner's two statements below are blatant lies. 1R) The reality is the investors at "PIMROCK" who participate in this plan will be reducing risk. They are willing to take a 7% hit by overbidding on toxic assets in order to guarantee payout on $trillions of bonds. 2) Allowing investors to leverage their money with government contributions and guarantees “is a relatively conservative structure,” similar to when an individual obtains a mortgage to buy a house. 2R) The reality is that Geithner's plan is NOT a "relatively conservative structure". Geithner's plan is a purposeful attempt to dump trillions of dollars worth of toxic assets right into taxpayers' laps, just to bail out the banks that got us into this mess. Let's revisit Geithner's Arrogance Knows No Bounds. Rep Gresham Barrett: "The last question I have guys, which is the $64 million question or I guess I should say $64 trillion question is: What's the backup plan? If everything fails what do we do? Where do we go from here?" Treasury Secretary Geithner: "Congressman this plan will work. This plan because of the authority provided not just by Congress but the treasury and the Fed gives us broad ability to do what you need to do to get through a financial crisis like this. It just requires will; It's not about ability. We just need to keep at it. We just need to work with Congress to make sure we do this on a scale that will make it work." Returning to the original thesis, Geithner's statement about "will" now makes sense. The "will" Geithner is referring to is the "will" of Congress to allow the Treasury and the Fed to sell off our future and the future of our children to prevent the bondholders of U.S. financial corporations from taking losses. Unfortunately, as it sits right now, that part of Geithner's plan can succeed. However, Geithner's plan sure as hell will not revitalize our economy.